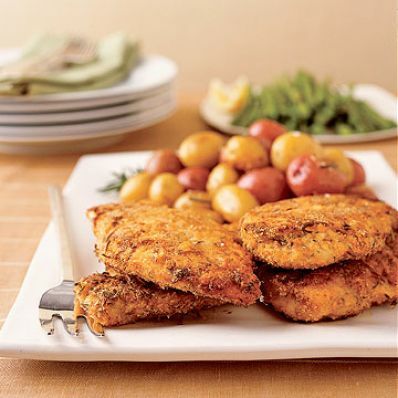 Marinate the skinless, boneless chicken breast halves in a spicy buttermilk mixture before coating with crumbs and oven-frying. 1 of 3 In a large bowl, whisk buttermilk, hot sauce, mustard, garlic, pepper and 1 teaspoon of the salt. Add chicken and turn to coat. Cover and refrigerate at least 4 hours or overnight, turning occasionally. 2 of 3 In a large bowl, combine bread crumbs, Parmesan, flour, thyme, paprika, cayenne, remaining 1 teaspoon salt and 2 tablespoons of the oil; mix well. Remove chicken from marinade; place in seasoned bread crumb mixture. Turn to coat. Place chicken on a baking rack and let sit for 20 minutes so that crumbs will adhere better. 3 of 3 Meanwhile, put remaining 1 tablespoon olive oil in a rimmed baking sheet and place in oven; heat oven to 400 degrees F. After about 5 minutes, place chicken on heated baking sheet. Bake at 400 degrees F for 30 minutes or until crispy, golden and baked through. Serve with roasted potatoes and green beans, if desired. Per Serving: 17 g carb., 13 g Fat, total, 103 mg chol., 3 g sat. fat, 1 g fiber, 963 mg sodium, 371 kcal cal., 45 g pro.